Hae Soo walks in to hear the bad news that her precious Jae Yul is schizophrenic. She refuses to believe that is true, but Tae Yong joins in to say he couldn’t find any evidence of Kang Woo. Meanwhile, Jae Yul smiles to himself as he reads Hae Soo’s message under his pictures about being over 51% convinced. It is such a sad contrast. Back to Hae Soo as she watches the security video of Jae Yul fighting himself. She gets a call from Jae Yul and she responds with hesitation. He asks her where she is and she lies that she is in a meeting. As they end the conversation he tells her he will not say ‘I love you’ as to not burden him, and that he is writing so don’t call. I’m glad he is learning to be more considerate towards her about things no interruption thing. After Hae Soo hangs up, Dong Min recounts what he knows about the murder case. He says that Jae Yul knows the truth as well which is why he created Kang Woo to relive everything. Everytime Jae Yul gets harmed while protecting Kang Woo he is in fact subconsciously self harming due to the guilt towards his brother, Jae Bum. Young Jin jumps in and asks Hae Soo for other signs of subconscious self harm, but despite remembering multiple incidents she lies and says there aren’t any. Instead, Hae Soo who is obvious denial, wants Jae Yul to get MRI tests. Hae Soo goes to Jae Yul’s room and calls him asking for Kang Woo’s manuscript. Jae Yul remembers back to when she came into his room long time ago and he was on the phone with Kang Woo. Hae Soo also remembers that she noticed him shaking his hand randomly at that time and now she knows he thought he was holding the manuscript. Back to current time, Jae Yul tells her that the manuscript in the right top drawer of her desk, and of course she does not find it. So Nyeo and Soo Kwang overhear Dong Min asking Hae Soo to get out of Jae Yul’s case. Soo Kwang suddenly remembers witnessing Jae Yul talking to no one outside the cafe one time. 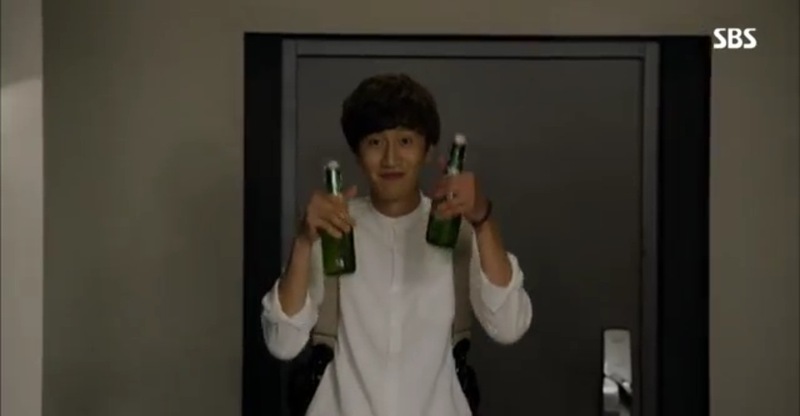 He resolves to go to Jae Yul’s house immediately. When he arrives, he feigns normality and even boasts about progress with So Nyeo. In the morning, Dong Min offers Hae Soo breakfast, but she leaves hastily, still upset. Meanwhile in Jae Yul’s house, Soo Kwang cooks breakfast and unplugs Jae Yul’s computer in order to get him to come to the table. Jae Yul still refuses to eat so Soo Kwang tries to feed him, but the plan backfires. Jae Yul dashes to the sink and vomits. Despite instructing him not to tell Hae Soo, Soo Kwang still texts her. In the next scene, Soo Kwang and Jae Yul play basketball out on a court. 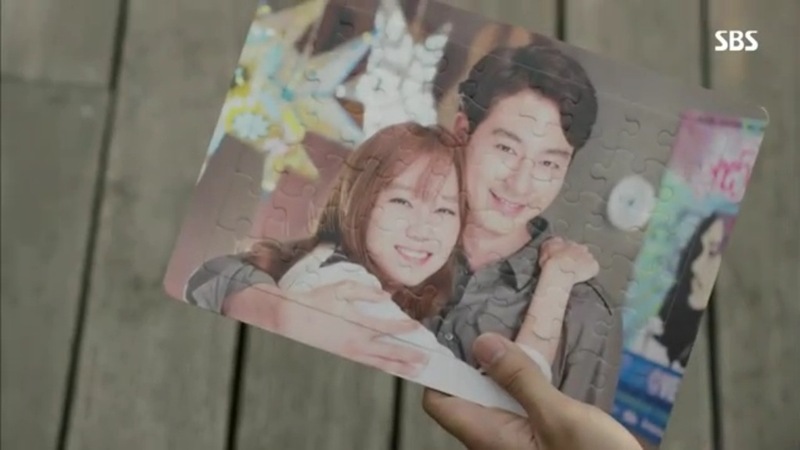 During a break, Soo Kwang gifts Jae Yul a puzzle made out of the couple’s picture. He jumbles all the pieces and they start to put it back together. Soo Kwang tells Jae Yul that for him, his disorder is like one piece of the puzzle, it is momentary. However, for schizophrenic patients like Hye Jin, the disorder is like a bunch of puzzle pieces and the world rips apart constantly, going from reality to fantasy in an instant. Jae Yul inquires, unaware of Soo Kwang’s implications, if the pieces can be put back. Soo Kwang replies it can be done with treatment and then takes off. Jae Yul kisses the completed puzzle and gets back up to play ball again. 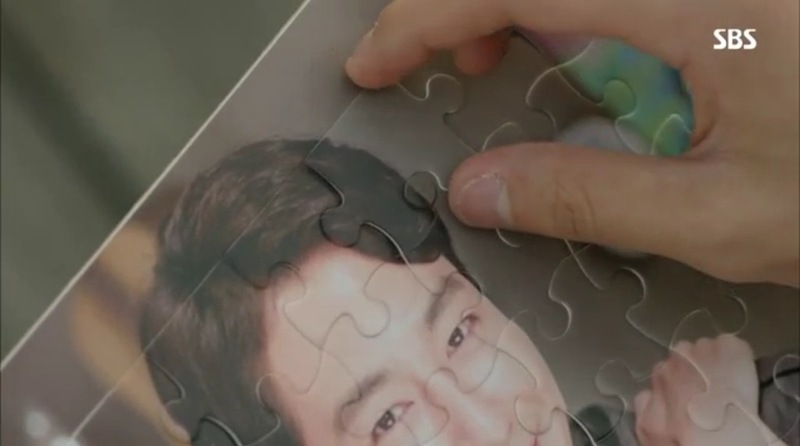 In another shot we see Kang Woo pulling a piece of the puzzle off. Uh oh. Jae Bum is still in prison and has begun to make roses for his mom while thinking about his brother, Jae Yul. Jae Bum seems to have some second thoughts and moments of softness, but he quickly recompose. I’m still hopeful for a tear jerking reconciliation. Hae Soo invites Jae Yul’s mom to her house to break the news, but Dong Min does so instead, omitting the fact that Jae Yul is suffering from schizophrenic by saying it is a curable disorder resulted from stress. He also gains permission from mom to admit Jae Yul to the hospital immediately. 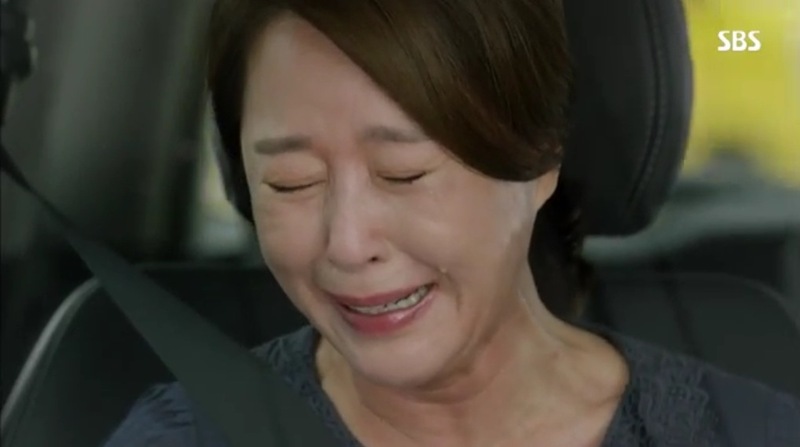 Once in Tae Yong’s car, mom breaks down in tears over her sons. Hae Soo is coming around as she, too, breaks down over Jae Yul. She confesses to Dong Min that perhaps she never truly sympathized with Jae Yul whenever he brought up his past. She pleads for Dong Min to not force admit Jae Yul into the hospital if it is possible. Hae Soo surprises Jae Yul with a visit on Thursday instead of Friday. She notices his coughs and twitches and remembers that these are the symptoms Jae Yul had previously described to her about Kang Woo. At mom’s house, Tae Yong is trying to get her to eat some apples but she angrily slaps the apple away and tells him to go see Jae Yul. He replies that he can only do so after she eats the apples. Her response? She starts eating the apple slices with both hands and crying at the same time. It is so pitiful and I feel so much for the mom. lady got mad crying chops. Back at Jae Yul’s house, the couple is looking at the pictures he took of Hae Soo’s mess, and also Hae Soo’s 51% message. He takes some pictures of her hands [that “I want to put on my forehead”] and feet [that “I wish would never stop walking her path”]. In exchange, she gets to shave off his writer facial hair. how can they be this cute even when shaving??? While shaving, Hae Soo asks Jae Yul what would he be most afraid of if he is admitted to a hospital. He answers not being able to write (I feared this! He won’t be able to write on meds). Hae Soo tells him that she will still like him even if he cannot do that. His response? 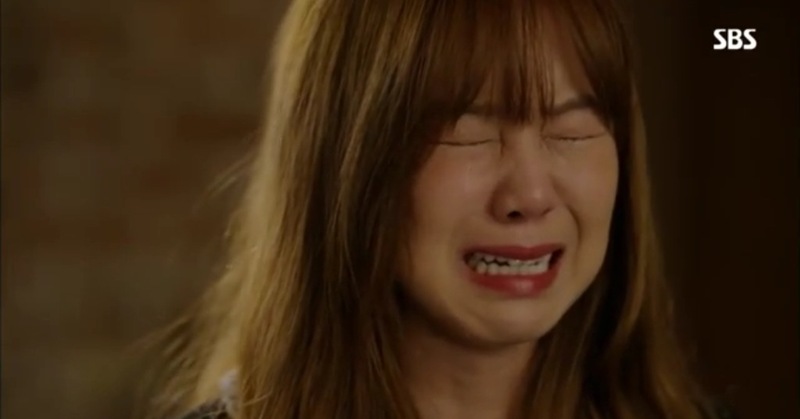 “When will you tell me you love me?” Oh, Jae Yul, she has you on a leash doesn’t she? Hae Soo steers the conversation further by asking about Kang Woo. Jae Yul surprises her by saying he thinks Kang Woo will die soon and that he has ALS. Hae Soo asks why he thinks that, and Jae Yul replies that Kang Woo’s facial expression wasn’t so good. She immediately asks how did he know Kang Woo’s expression wasn’t good when he did not go to the hospital with Kang Woo. Jae Yul is also puzzled and even questions himself. No matter, he tells Hae Soo “I love you,” and goes to shower at her urging. What does she do? She copies his manuscript off of his computer to give to Tae Yong. Jae Yul comes out of the shower to discover Hae soo gone. He answers a call from Kang Woo and tells Kang Woo “you will never be alone.” Yikes. Where is Hae Soo? She is meeting up with Tae Yong in his car. (Nothing scandalous, guys). Tae Yong looks at the manuscript she got off Jae Yul’s computer and declares that Jae Yul has been plagiarizing his own work this whole time. Hae soo finally comes the the conclusion that Jae Yul is very sick because he is unable to eat or write, both functions he used to have control over.